The latest sailing programme to hit the satellite screens is Inside Sailing. 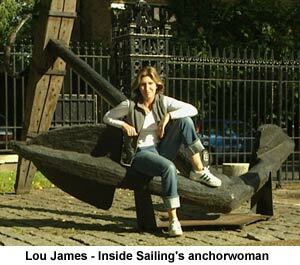 Produced by the Turner network’s CNN, the show is hosted by anchorwoman Lou James, with help from business anchors Becky Anderson and Liz George, and takes us through what’s new in the world of sailing. With excellent access to the big names in sailing, the first show opens with a look at the America’s Cup. The pilot joins Olympic gold medal-winning rower Greg Searle as he takes us through the training regime he runs at GBR Challenge. Searle wants GBR Challenge to be the fittest team on the water in Auckland. Next, BMIF’s John Clarke and Oyster Marine’s Richard Matthews air their views on Britain’s boatbuilding business, a refreshing break from the staple diet of racing that usually fills sailing’s airtime. Their optimism is unfortunate in the light of Rival Bowman’s problems but with enquiries up and order books crammed for the next two years, Matthews has every reason to be confident. A quick racing round-up precedes the break and the second part opens with a look at the Volvo Ocean Race. First we are brought up to speed on the latest developments then we look at the special environmental project running in tandem with the race. Oceanographer Dr Simon Boxhall explains how instruments fitted to each boat measure the sea’s colour and temperature to work out the distribution of phytoplanckton in the world’s oceans. Phytoplanckton is the bottom link anchoring the ocean’s intricate food chain and the state of its health is critical for the thousands of species in the chain. The show wraps with a profile of the first person ever to hold the holy grail of short handed sailing – a solo and non-stop passage around the world – Sir Robin Knox-Johnston. He takes us through his career, from the Golden Globe to ENZA’s Jules Verne record (“The most fantastic sailing, I’d do it again tomorrow”) to the Clipper Challenge, noting in the 800 Clipper sailors so far the same changes he saw in himself after his epic voyage ended in 1969. The first of a regular magazine of shows, made in association with UBS Financial Services, airs at 2030 GMT on Sunday 25 November and will go out at the same time on the last Sunday of every month with repeats at 1730 the following Wednesday and at 1830 on Saturday.